President Donald Trump on Friday announced he is suspending a controversial decision to lift the ban on importing trophies of dead elephants from Zimbabwe and Zambia into the U.S., which had been assailed by conservation and animal rights groups. "Put big game trophy decision on hold until such time as I review all conservation facts,” Trump said on Twitter. "Under study for years. Will update soon with Secretary Zinke," Trump said in the tweet, referring to Interior Secretary Ryan Zinke. Zinke said in a statement later Friday that "the issuing of permits is being put on hold as the decision is being reviewed." The U.S. Fish and Wildlife Service confirmed on Thursday it lifted the ban. 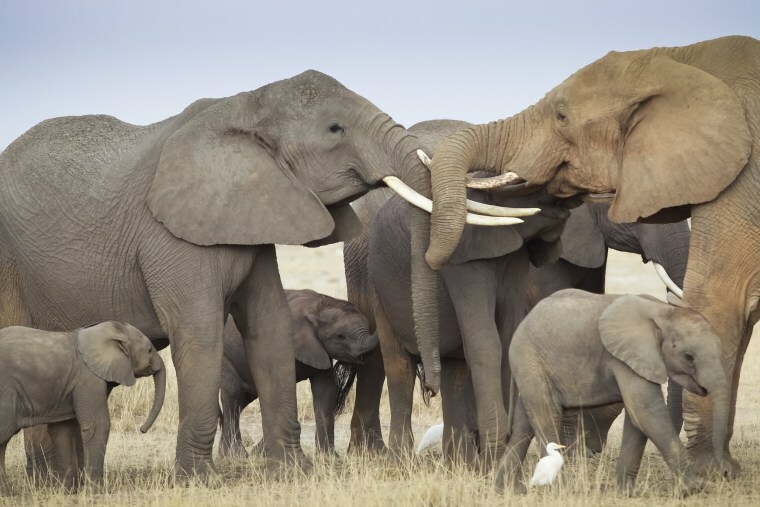 The agency "determined that the hunting and management programs for African elephants in Zimbabwe and Zambia will enhance the survival of the species in the wild," a spokesperson for the agency said. The move would overturn a 2014 rule implemented under the Obama administration that banned hunters from bringing the trophy heads of elephants they'd killed in Zimbabwe and Zambia back to the U.S. Animal rights groups blasted the decision. Conservationists and wildlife advocates were critical of the timing of the move, noting the political turmoil in Zimbabwe, where the military has seized power and had held President Robert Mugabe under house arrest. The Republican chairman of the House Foreign Affairs Committee, Rep. Ed Royce, R-Calif., called the Fish and Wildlife Service decision to lift the ban "the wrong move at the wrong time" and in a statement on Friday called on the Trump administration to withdraw it. And critics noted that Trump's adult sons, Donald Jr. and Eric, are known big game hunters. Photographs of the pair surfaced in 2012 showing the two men posing with the carcasses of several dead animals from a hunting trip they'd taken a year earlier in Zimbabwe. The reversal of the ban would have applied to dead elephants hunted in Zimbabwe from Jan. 21, 2016, to Dec. 31, 2018, and to elephants hunted in Zambia in 2016, 2017 and 2018 "for applications that meet all other applicable permitting requirements," a Fish and Wildlife spokesperson said. The agency said that well-regulated sport hunting as part of a management plan can provide local incentives for conservation and raise money for conservation efforts. The African bush elephant is currently listed as endangered under the Endangered Species Act, but a provision of the law allows for the import of trophies if it can be proved that hunting the animals contributes to conservation efforts. The African savanna elephant population was found to have declined by 30 percent overall between 2007 and 2014, according to the Great Elephant Census in 2016. The population in Zimbabwe was found to have declined 6 percent overall, but some regions in the country reported populations were down as much as 74 percent. Wayne Pacelle, the CEO of the Humane Society of the United States, said on Twitter that he was grateful that Trump was reviewing the decision to lift the trophy ban. Grateful to @POTUS @RealDonaldTrump for reassessing elephant and lion trophy hunting imports. This is the kind of trade we don't need. The announced reversal of the Obama-era ban on elephant trophies was lauded by hunters’ rights group Safari Club International (SCI) and by the National Rifle Association, the two groups that had filed suit to challenge the ban. Hunters groups argue that hunting for sport can bring in tourism revenue that can aid conservation programs. The Fish and Wildlife Service said it had decided to allow the imports because the government of Zimbabwe, non-governmental organizations, hunter associations and other groups had provided the service with additional information that addressed the concerns in the FWS' previous findings that led to the ban. Royce, the chairman of the House Foreign Affairs Committee, said in the statement Friday that "Zimbabwe is in economic and political crisis." "In this moment of turmoil, I have zero confidence that the regime — which for years has promoted corruption at the highest levels — is properly managing and regulating conservation programs. Furthermore, I am not convinced that elephant populations in the area warrant overconcentration measures," Royce said.